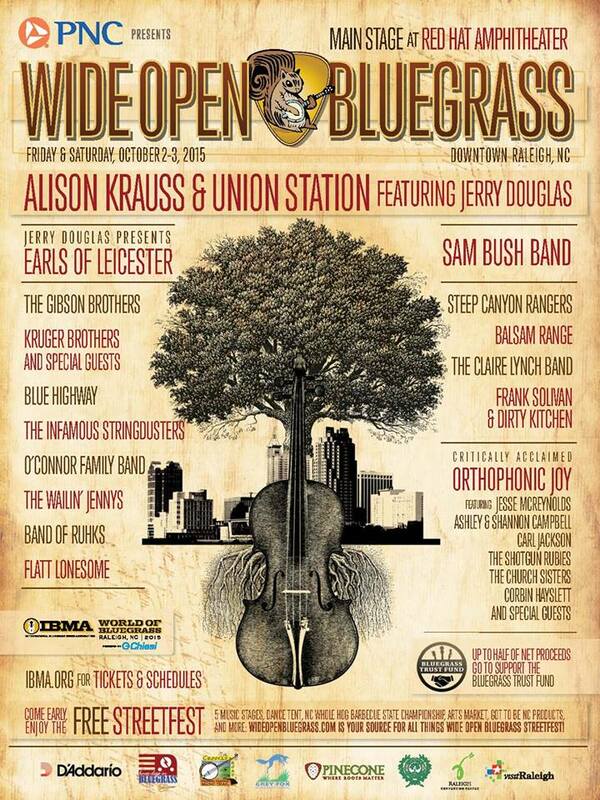 Due to the impending severe weather associated with Hurricane Joaquin, this weekend's big outdoor Wide Open Bluegrass Festival shows set to take place at the Red Hat Amphitheater on October 2 and 3 will now be moved indoors. The shows will now take place in Halls A and B of the Raleigh Convention Center, right across South McDowell Street from the amphitheater. Friday night's show headlined by Alison Krauss and Union Station is sold out, but tickets are still available for Saturday night's show headlined by Jerry Douglas presents Earls of Leicester and the Sam Bush Band. Ticket are available via Etix. In addition to the ticketed events moving indoors, the free street festival on October 2 and 3, including the performances as well as vendors, will also move into the convention center. Check HERE for the latest changes to this weekend's big event.